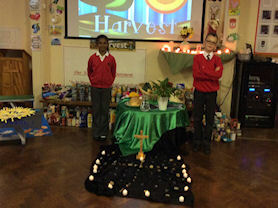 On Tuesday morning, the whole school gathered together for our annual Harvest Assembly. Miss McCarron, Miss Dunne and Mrs Whitty led the school through a truly reflective presentation that challenged us firstly to acknowledge what we are grateful for. Each year group created a banner to show their thanks for a different element that contributes to our harvest. It proceeded then to make us reflect further on the need to share, share whatever we can with our neighbour whether it be food, time or a simple cup of tea. 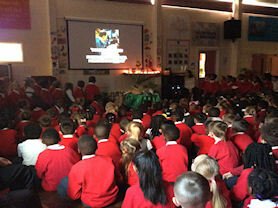 Part of the assembly showed a film outlining the work St. Chad’s Sanctuary carries out in the city centre, in short it helps all our neighbours who are most in need. 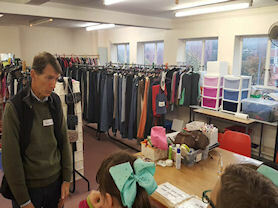 On Thursday Mr Barton took some children to visit the Sanctuary. The children handed in all of the tins that they had kindly donated and also had the opportunity to see the work that goes on first hand. 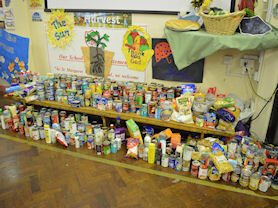 We would like to thank all of the children, parents and staff for sending in a record amount of food. Well done! Our Head Girl and Boy leading the Harvest Assembly. The whole school took part. The children visited St. Chad's Sanctuary.